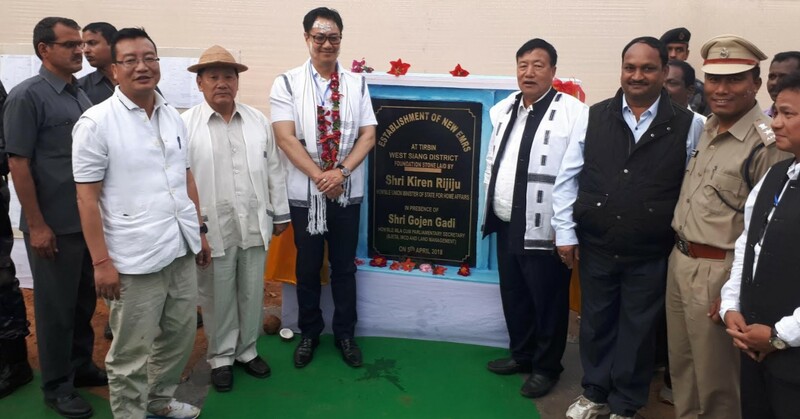 Union Minister of state (Home) Kiren Rijiju today laid foundation stone for two major project in Tribin Circle of Lower Siang district . the first project is Eklavya Model Residential School at Tirbin of multi-storeyed school complex for 100 boys and 100 girls borders at an estimated cost of 16 crore approved by Ministry of Tribal Affairs, Government of India being executed by the RWD Aalo Division, Executive Engineer Tanga Kena said. The second project is under scheme ‘Khelo India’ of construction of multipurpose Indoor Stadium at an estimated cost of 6 Crore at Tirbin township. The scheme is being executed by the Engineering wing of the Department of Sports and Youths Affairs, Deputy Director Heri Robin informed. While laying the foundation stoned of both project at two different location Union Minister of state (Home) Rijiju said that it is an opportunity that the Tirbin have been able to get numbers of schemes for the development of area and was possible due to better coordination of local MLA Gojen Gadi with state and central government and the people of the area need to cooperate for the successful implementation of both schemes with quality and time. He requested the local leaders and administrative officer to take care of many such other schemes which have been approved and sanctioned by the state government.